If you want to learn how to sing better, you need to broaden your vocal range. Logically, first of all, you have to find your vocal range and own it! So the question of the day is: How to find your vocal range? You need to employ a number of techniques that have been developed by experts in this field. These techniques have a primary goal to help you identify your voice type as well as the scope between both the highest note you can sing and the lowest pitch you can perform. Once you find your vocal range, you can work on broadening it with incremental practice. But, first things first, let us initially define how to find your vocal range. Its most common application is in distinguishing singing voices and classifying them into groups recognized as voice types. Therefore, the FIRST STEP in finding your vocal range is to define your voice type. Your range is in line with your voice. It is important to know your voice type so that you can know which notes you can reach when singing. This can help you choose the type of music or a certain song that will secure you a shining performance. Note: You need to know the numbering system on a keyboard and how to supplement note names with the appropriate octave number on a keyboard. the lowest female singing range (usually ranges between F3 to F5). Contraltos can sing BELOW the usual alto range and resemble tenors (as low as E3). Generally, altos are rich and full in the lower register. the middle-range female voice type (usually lies between A3 and A5). 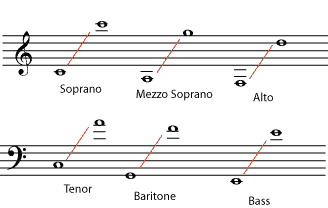 It can overlap both the soprano and alto range (go as low as G3). Note: Vocal ranges of solo singers and choruses can differ, and that explains the different ranges found in various other sources such as the New Harvard Dictionary of Music, the Wikipedia, or the Catherine Schmidt-Jones' chart. You can find more on that subject here. Most people with singing experience are probably already acquainted with these types, but if you have not discovered which voice “type” fits you, you can follow the provided instructions and try to find it. When you determine your voice type, you can practice to broaden it. You can do this in half steps at first and, in time, that will lead to the full-step increases in range. Start the practice with short scales and then move on to forcing your voice to higher or lower levels. It would be best for you to work with a vocal coach. These characteristics play a HUGE role in cases where vocal range cannot be clearly defined, or better to say, borders two voice types. You can then use these vocal variables to define your voice and range more precisely. The vocal range can be further distinguished by the help of vocal registers. Every vocal register is set APART by a distinct timbre. Each register requires different actions of the vocal cords as well. It is the lowest vocal register which is most evident in low-voiced male singers. The sound is formed when the air passes through a loose glottal closure, and the vocal folds vibrate. It has a very low frequency and is rarely used. (or chest voice) - It is the most natural register you use for singing or speaking and thus mostly utilized too. If you raise the pitch in this register, you will lengthen your vocal folds and increase tension. It is a high vocal register (at the high end of your register) that makes you feel the sounds you produce in your head rather than your chest. The vocal folds elongate and the ringing sounds resonate in your head. It is the voice included in the head voice register and both male and female singers can produce it. It is thinner than the head sound and extends beyond modal by about one octave. In order to master the falsetto, try to maintain an evenly flowing tone throughout your vocal range. It is the highest register of your voice. These super-high notes are mostly produced by female singers. The sound resembles that of a whistle: It has a distinctive shrill timbre. Note: You have to know scientific pitch notation numbers as they are necessary to determine your vocal range. They will mark the lowest note you can produce as well as the highest notes in modal and head voice. If you can reach whistle or vocal fry register, you may note down pitch notation numbers for them too. The range should always be defined from the lowest notes to the highest ones. For more info watch this video. It would be best to use a piano (or at least a piano-like instrument such as a keyboard) so that you can play and sing the notes. If you cannot obtain the real thing, there are numerous piano apps available for download. These apps usually display the correct scientific pitch notation for every key you play and thus make the job even easier. Sing vowel sounds as higher notes (C4 for females, or C3 for men) and then try to match all the keys all the way down to your lowest register. The last note you can produce comfortably (without making it sound breathy or cracky) is your lowest normal-voice note. Note down both your normal-voiced lowest note and your breathy one (they can be the same too!). In order to do that, look at the key that note corresponds to and determine its appropriate scientific pitch notation. Sing a high note you do not have difficulty reaching in your modal (normal) voice. Go up the scale, key by key. The females should start at C5 and ascend from there, while male singers should first play and match G3. You MUST not allow slipping into falsetto! Once you reach the highest note you can produce naturally- without putting too much strain on your vocal cords, you have found your normal highest note. Be careful not to include the notes that cause breathiness or a break in your voice as that will signal your departure from the modal register. If you feel your vocal cords have to alter the way they work, stop- you are out of the comfort zone for sure! The GOAL is to find the highest note you can sing in falsetto. Most singers can do falsetto and go higher than their modal register. The falsetto notes REQUIRE your vocal cords to stay open and relaxed, as well as vibrate less. So, relax your vocal cords and try to go higher than your normal voice. It will take some effort and the notes will come out breathy. Continue until you find the highest flute-like falsetto note you can produce without cracking. If you can you have a whistling voice as well and your highest note belongs to that register. once you locate the highest notes, you should record them by using the scientific pitch notation. Note down the highest normal-voiced note and the one that you can reach without straining be it in a falsetto or whistle range. As long as you can produce the note comfortably, it does not matter if it does not sound 100% perfect- practice will make it perfect in time! If you followed all the instructions to the letter, you should have recorded four notes: two low ones and two high ones. They must be arranged from the lowest to the highest and expressed in scientific pitch notation. Your full vocal range is noted in front of you! Congratulations! The inner notes (two middle pitches connected with a dash)T stand for your “tessitura,” your normal vocal range. You can produce these notes most comfortably. The remaining two notes (the ones in parentheses) denote your full range. These are the notes you are capable to produce with some effort. You should now count the notes between your lowest and highest note by using your keyboard, and you are almost done! Once you count the exact number of notes in between your lowest and highest pitch, you can move on to calculate the octaves in your vocal range. One octave comprises of eight notes, but the last note in one octave counts as the start of the following one as well. Therefore, count the total number of notes in your range in the sets of seven and you will have the correct number of octaves. For example, if your lowest note is A2, and the highest note you can produce is A4, you are a baritone with a range of two octaves. If you happen to have partial octaves (you cannot comfortably sing all the notes in the last octave), count them in as well. Those are partial octaves and they are rather common. You could already notice in the example given in the previous section, that it is now rather easy to determine your voice type. Simply look at the vocal range you have recorded using scientific pitch notation and find your vocal classification in the section How To Find Your Voice Type (or use any other trusted or recommended source). Your full range should fit in one of the voice type predefined range. If you cannot find a perfect fit for your range, do not worry- just go for the closest match!